Jeanne Antoinette Poisson, Marquise de Pompadour, may be best known as King Louis XV's Chief Mistress. But she was also a highly educated tastemaker, a patron of the arts, and an artist in her own right. 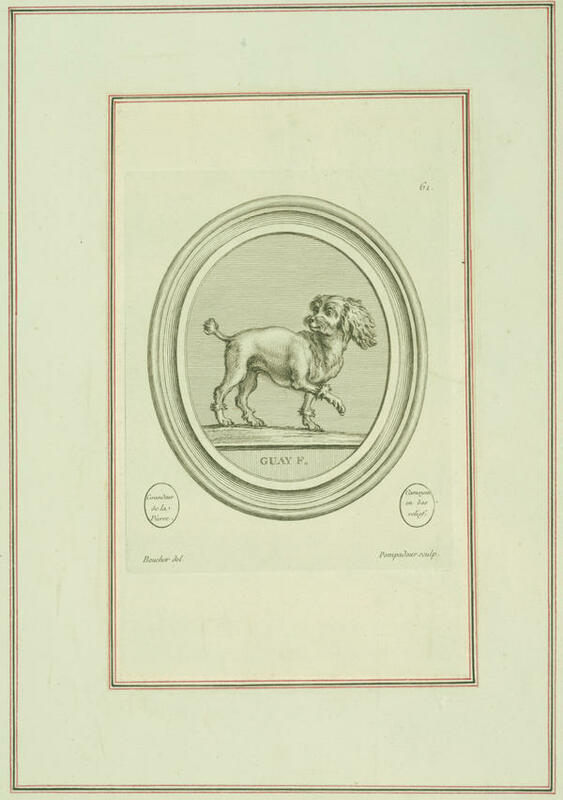 In this etching, circa 1758, Pompadour captures her pet spaniel, mid-trot. 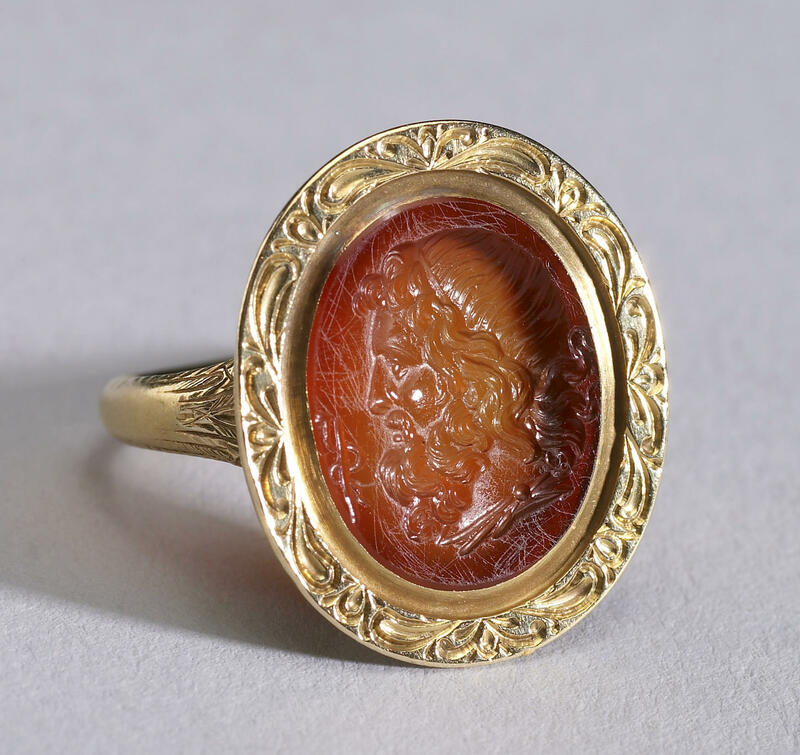 This carnelian and gold ring shows the profile of Asclepius, Greek god of medicine and healing. Columbia University art historian Susan Wager found this yellow, leather portfolio among a batch of items purchased by museum founder Henry Walters in 1895. 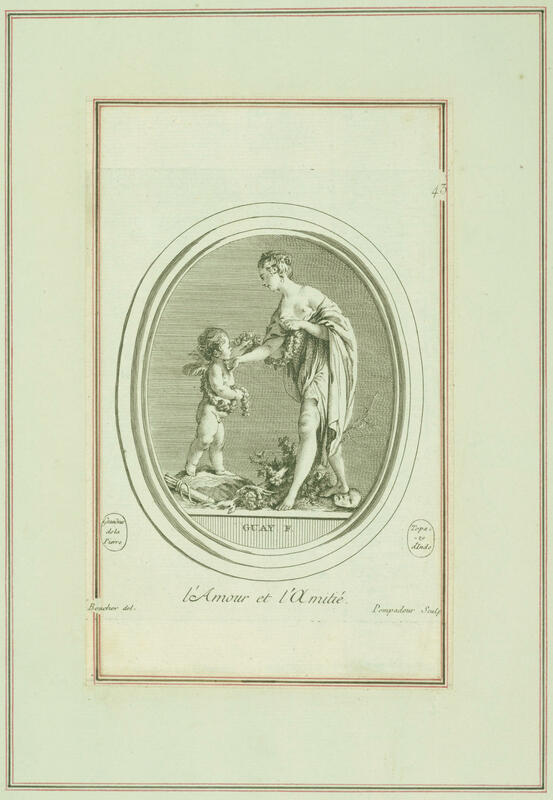 Inside were etchings by Madame de Pompadour. Here, Pompadour shows Love encircling Friendship with a floral garland. When Louis XV, King of France, first met the woman who would become his chief mistress, she was dressed as a domino, and he was dressed as a plant. It was 1745, and Jeanne Antoinette Poisson, the pretty young woman who would become Marquise de Pompadour, had been invited to a masked ball at Versailles. If this sounds like a chance meeting, it wasn't — her family had been strategizing to orchestrate this very moment for years. "They envisioned her having this role when she was just a bourgeois young girl living in Paris, and they made it happen," explains Columbia University art historian Susan Wager. 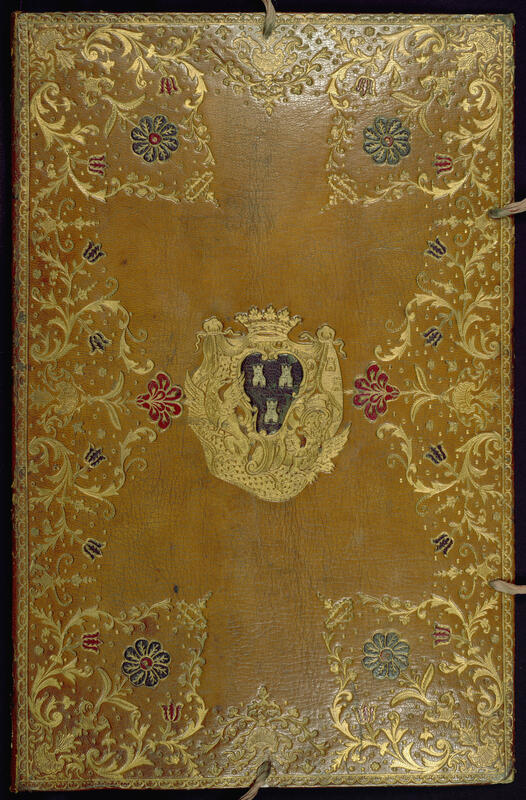 Not long ago, Wager discovered a leather portfolio containing etchings made by Pompadour. For over a century, the portfolio and its etchings had gone unrecognized. Wager discovered it at the Walters Art Museum in Baltimore, Md., among a batch of items founder Henry Walters bought in 1895. "I was so thrilled," she recalls. "When I pulled that out of the box in the manuscripts room, my heart started to pound. I could barely talk." Wager curated an exhibit of those etchings and other works by Pompadour, which is now on view at The Walters. "She was one of the smartest women ever associated with the French crown," says University of Pennsylvania professor Joan deJean, author of The Age of Comfort. A well-educated tastemaker, Pompadour hung out with Enlightenment intellectuals like Voltaire and Diderot and she lobbied for the publication of France's first encyclopedia. "She's a real brand name in the world of style," says deJean (just think of the name of Elvis Presley's haircut!) "She was like a minister of the arts." Pompadour was a patron of artists — their chief customer — says Wager: "She would give them money to make paintings and have them put in her houses so people could see them there." And Pompadour herself made art. "She brings the most talented gem carver to live with her at Versailles," Wager explains. "She buys a drilling machine — which is the tool that you need — puts that in her apartments, and has him come and live there and make gems for her." And not only did he make gems for her — but he taught her how to make them herself. She carved little scenes and cameos into semi-precious stones — carnelians, topaz — for rings and bracelets. To make a permanent record of the gems, Pompadour had artists draw them, and then she learned to make etchings from the drawings. Some of the stones, rings and delicate, charming etchings are on display at The Walters: One sketch depicts love and friendship. Another shows a beautiful woman reaching her hand out to a cherub, the two intertwined with a garland of flowers. In a third, Pompadour's little pet spaniel looks up expectantly, tail wagging, paw lifted. There were 52 etchings in all. Pompadour made fewer than 20 copies of them and gave them as gifts. She put her own set in a lemon-yellow leather portfolio — the one that Wager found. "It has this gorgeous, gold embossed coat of arms at the center and all this gold lacework," Wager says. Wager did some Nancy Drew sleuthing with this portfolio: She knows it was Pompadour's personal set because it's printed on different paper than the other surviving sets (indicating it was a first-run printer's proof). There's also a hand-written table of contents inside — no other surviving set has that list. Wager's breath was taken away when she found that portfolio, and Louis XV likely felt the same way when he first met the beautiful, young Jeanne Antoinette at that Versailles ball in 1745. It didn't take long for Louis to move her into a fancy Versailles apartment, where she became Chief Mistress. His wife, Queen Marie, is said to have remarked, "If there must be a mistress, better her than any other." At court, Pompadour was careful to stay on the queen's good side, and show her respect. Five or so years after they met, the relationship between Pompadour and the king changed. Diaries and letters report that in 1750 Pompadour switched floors at Versailles. "But what's really remarkable is that she still remained at court in the position of official mistress for the rest of her life even though there was no longer a sexual relationship," says Wager. Louis relied on her as a trusted friend and advisor — she was also an arts patron, administrator, organizer and facilitator. "There's this famous line — 'The King only loves you for your staircase,'" Wager says — referring to the circular staircase Louis constructed at Versailles to connect his room to his mistress' room. "But I think it means so much more than that — this idea of the staircase as this mediating passage ... She was mediating between members of the court and the king. They would say 'I want to say this to the king.' And she'd say, 'No, wait, let me tell him. Let me translate it into my own words and I'll come back to you.' She was, in all sorts of ways, manipulating this idea of the staircase — of the passage — in an artistic, in an intellectual and in a political way." Pompadour may have been brought on as a mistress, but she ended up being much more than that. Her artwork is on display at The Walters through the end of May. Baltimore, Md., calls itself Charm City. And a small exhibition at The Walters Art Museum there oozes charm. It's a collection of 18th-century etchings by Madame De Pompadour, the charming chief mistress of French King Louis XV. This show also solves an artistic mystery. 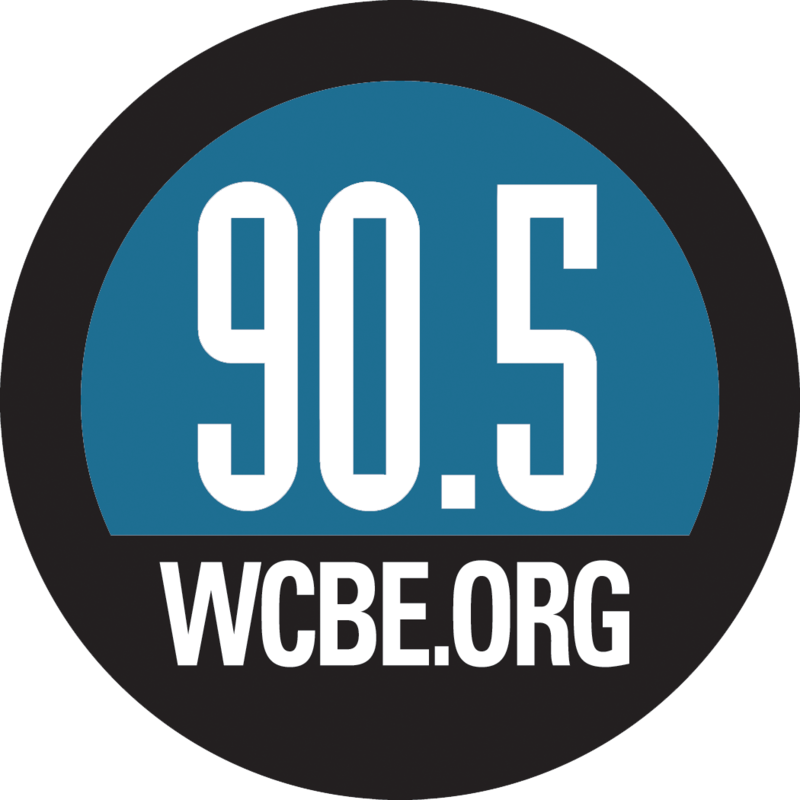 NPR's special correspondent Susan Stamberg explains. SUSAN STAMBERG, BYLINE: It's hard to say her name properly. JOAN DEJEAN: Jeanne Antoinette Poisson, Marquise de Pompadour. STAMBERG: And we don't know much about her these days. But in 1946, she showed up in a hit song. DOROTHY LAMOUR: (Singing) When Madame Pompadour was on a ballroom floor, said all the gentlemen, obviously. The Madame has the cutest personality. 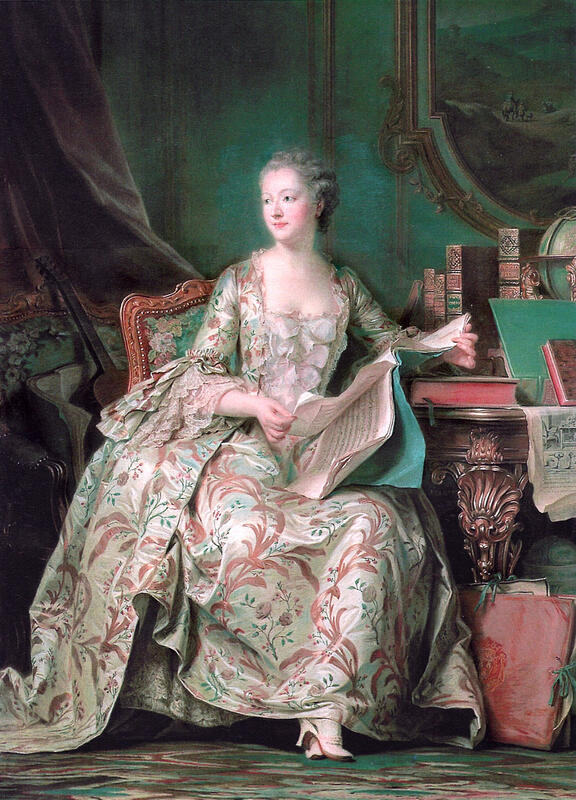 STAMBERG: Madame de Pompadour had a lot more than that, says University of Pennsylvania professor Joan DeJean, author of "The Age Of Comfort." DEJEAN: She was one of the smartest woman I think ever associated with the French crown. STAMBERG: Well-educated, she hung out with Enlightenment intellectuals Voltaire, Diderot. She lobbied for the publication of France's first encyclopedia. She was a tastemaker. DEJEAN: She's a real brand name in the world of style. STAMBERG: Elvis Presley's hair cut - named for her. Fine porcelain, literature - promoted by her. DEJEAN: She was like a minister of the arts. STAMBERG: She was a patron of artists. Their chief customers, says Susan Wager, an art historian at Columbia University. She curated this show at The Walters. SUSAN WAGER: She would give them money to make paintings and have them put in her houses so that people could see them there. STAMBERG: And Madame Pompadour herself made art. WAGER: She brings the most talented gem carver to live with her at Versailles. She buys a drilling machine - which is the tool that you need - puts that in her apartment and has him come and work and live there and make gems for her. STAMBERG: And teach her how to make them, how to carve little scenes, little cameos into semi-precious stones - carnelians, topaz - for rings and bracelets. She decides to make a permanent record of the gems and has artists draw them and then teach her how to make etchings from the drawings. The Walters Museum displays some of the stones, rings and delicate charming etchings - a sketch depicting love and friendship, a beautiful woman reaching her hand out to a cherub, the two intertwined with a garland of flowers, one of her pets? WAGER: This is one of her little spaniels, probably the one that was called Bebe. We have this sweet little moment where the dog has just been interrupted by something. You know, her tail is wagging. Her head is turning behind her. Her paw is lifted. STAMBERG: There were 52 etchings. Pompadour made fewer than 20 copies of them and gave them as gifts. She put her own set in a lemon-yellow leather portfolio. WAGER: And it has this gorgeous, gold embossed coat of arms at the center and all of this gold lacework. STAMBERG: Wager did some Nancy Drew sleuthing with this portfolio. She knows it was Pompadour's personal set because it's printed on different paper than the other surviving sets, indicating it was a first-run printer's proof. And there's a handwritten table of contents inside. No other surviving set has that list. And for years it was thought to be lost. Wager discovered it at The Walters Museum among a batch of things founder Henry Walters bought in 1895. How do you say eureka in French? WAGER: (Laughter) I can't think of that. STAMBERG: How about (speaking French)? STAMBERG: You must have just been so thrilled. WAGER: I was so thrilled. When I pulled that out of the box in the manuscripts room, my heart started to pound. I could barely talk. STAMBERG: You know, that may be just the way Louis XV felt when he first saw Jeanne Antoinette in 1745. WAGER: She got an invitation to attend a masked ball at Versailles. She was dressed as a domino and the king was dressed as a plant. I think there were several plants identical because they didn't want everyone to know who he was. STAMBERG: You know, they knew how to have a good time. WAGER: They sure did. (Laughter) yeah. STAMBERG: She was a great beauty under her domino. And the king noticed that. But she didn't meet Louis by accident. WAGER: The truth is that she and her family had been planning for that to happen for a long time. And this is only just starting to come out now. There was a recent biography that just gets into the details of how strategic they were, how they envisioned her having this role when she was just a bourgeois young girl living in Paris. And they made it happen. STAMBERG: Louis moved her into a fancy Versailles apartment where she became chief mistress. His wife, the queen - yes, they sure knew how to have a good time - the wife is said to have said, if there must be a mistress, better her than any other. At court, Pompadour was careful to stay on the queen's good side and show her respect. Five or so years after they met, the relationship between Pompadour and the king changed. Diaries and letters report that in 1750, Pompadour switched floors at Versailles. WAGER: But what's really remarkable is that she still remained at court in the position of official mistress for the rest of her life even though there was no longer a sexual relationship. STAMBERG: Louis relied on her as a trusted friend and advisor and arts patron, administrator, organizer, facilitator. WAGER: There is this famous line - the king only loves you for your staircase. STAMBERG: He had put up a circular staircase at Versailles to connect their rooms for conjugal visits - don't you know? WAGER: But I think it means so much more than that because this idea of a staircase as this mediating passage, the space between things, is something that she really sort of absorbed into her identity - that she was mediating between members of the court and the king. They would say, I want to say this to the king. She would say, no wait, let me tell him. Let me translate it into my own words, and then I'll come back to you. So she was in all sorts of ways manipulating this idea of the staircase, of the passage, in an artistic and intellectual and in a political way. STAMBERG: Susan Wager curated the exhibition of engravings by Madame Pompadour. It's at The Walters Museum in Baltimore and shows that the chief mistress of France's King Louis XV was much more than a mere mistress after all. I'm Susan Stamberg, NPR News. LAMOUR: (Singing) When Madame Pompadour was on a ballroom floor, said all the gentlemen, obviously. The Madame has the cutest personality. Transcript provided by NPR, Copyright NPR.